We are all seeing the situation develop in the Middle East, and most recently, the worsening of the Arab-Israeli conflict. Clearly, what is happening now could lead to military action of greater consequence if the situation degenerates and other powers become involved. The America First Party works to advance the position that we should be neutral in conflicts which do not relate to the national security of the United States. It is true that members of our party may personally favor either the Arab or Israeli side, or neither side. Regardless of what our personal assessment of the conflict may be, we believe that we must be steadfast in holding to the position that the military and financial resources of the U.S. government can not be legally used to favor foreign powers in matters having no relation to the constitutional purpose of our government. 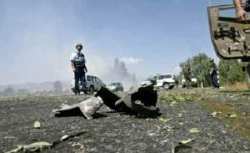 Lebanon - According to the AFP news service, as of August 11, more than 1000 Lebanese civilians had died in Israeli attacks on Lebanon since the start of the offensive on July 12, 2006, while nearly a million had fled their homes. A total of 38 Israeli civilians had lost their lives from Hezbollah rocket fire, while 82 Israeli soldiers were lost in combat since the start of retaliatory operations. As a nation we are far from neutral. The House and Senate resolutions supporting Israel in the Lebanon conflict, which overwhelmingly passed both chambers in July, demonstrate this, as do other policies which favor Israel in the overall Arab-Israeli conflict. Through this favoritism, we are unmistakably involved in this bitter and unrelenting conflict, and more likely to suffer damaging consequences. Therefore, we need to better understand the situation, why our government�s present posture is inappropriate, and the history of this long-standing conflict. "Against the insidious wiles of foreign influence (I conjure you to believe me, fellow-citizens) the jealousy of a free people ought to be constantly awake, since history and experience prove that foreign influence is one of the most baneful foes of republican government....Excessive partiality for one foreign nation and excessive dislike of another cause those whom they actuate to see danger only on one side, and serve to veil and even second the arts of influence on the other. Real patriots who may resist the intrigues of the favorite are liable to become suspected and odious, while its tools and dupes usurp the applause and confidence of the people, to surrender their interests......The great rule of conduct for us in regard to foreign nations is in extending our commercial relations, to have with them as little political connection as possible." Potent resistance. Israeli tanks burning in Lebanon, August 2006. Yet despite the wisdom our founders, which has its roots in the experience of history, the U.S. finds itself strongly favoring and protecting Israel by showing partiality in the Arab-Israeli conflict, with the predictable result that we are increasingly the object of hatred for many in the Middle East. We have done this by permitting supplies of highly sophisticated weapons to Israel, while permitting less to be supplied to other Arab states which have historically opposed Israel. We have also heavily favored Israel in our unconstitutional foreign aid commitments, even though Israel has one of the highest per capita incomes in the world. The Constitution clearly does not authorize this. It only permits expenditures to "pay the debts and provide for the common defense and general welfare of the United States", and so our aid to all Middle Eastern nations is illegal and should cease. Given that about 25% of our huge national debt is related to foreign aid, this is the only thing a responsible Congress would do. Since the founding of Israel, we have given it about $100 billion in direct military and nonmilitary aid. Our annual aid grants since 1997 have ranged from $2.6 to $4.1 billion . Before the recent Iraq war, Israel was the top recipient of U.S. foreign aid worldwide, with Egypt second. Since 1979, Egypt has received about $1.3 billion in military aid and $815 million in economic assistance -- $2.1 billion a year. Washington was wise to revile unnecessary foreign involvements. Unfortunately, our choice of involvement in the Middle East is one of the worst choices possible. The conflict there between Zionists (those who favor a national homeland for Jews) and non-Zionists has been going on for almost a century, and as this article will show, is comparable to a can of worms. Both sides have possessed violent factions which have committed atrocities against the other. Among the violent factions today, there seems to be an attitude of revenge and reprisal, resulting in almost endless brutality on both sides. But with our military aid and favoritism, it is the Israeli government which has acquired the greatest capability to do harm, and to the grave detriment of our national interest. One of the Hezbollah rockets that hit the Israeli town of Kiryat Shmona in July, 2006. Most of us have seen reporting in recent years of the terrible atrocities by Arab extremists. The many instances of barbaric suicide bombings in Israel which are directed at Israeli civilians, and which cause unspeakable carnage and misery, are a sign of the dangerous intensity of the conflict and of the hatred of the attacking parties. Systematic Hezbollah rocket volleys on civilian targets in Israel are also clear evidence of moral bankruptcy, as is the readiness of some Lebanese civilians to support an organization which engages in such indecent tactics. In trying to get a sense of the history of the conflict, it can be difficult to find unbiased sources. Both sides have an agenda, and groups associated with each have appeared like moral relativists through the years, overlooking atrocities and acts of terrorism when their goals have been served by them. Since the morals of some Arabs and Zionists are highly questionable, great care needs to be taken to find an information source which is likely to be truthful. August 9, 2006 - Running for a shelter in Kiryat Shmona. Residents of Kiryat Shmona are undergoing evacuation, the first evacuation of the entire town since Israel�s creation. The little understood reality is that atrocities, hatred, and indecency have characterized factions on both sides of the conflict, although relatively little is said about these problems in the U.S. media when they come from the Zionist side. This is a strong indicator that devotion to the concept of a Jewish homeland, which is in itself fine, has degenerated into an obsession for many in our government and media, resulting in an undue bias in government policy and reporting. This being the case, it is especially important to make an effort to understand the complete history. An article written by Matthew Hogan (see it here), an attorney from Texas, advances this purpose. It seems to be a sincere attempt to honestly portray the war between the opposing groups up to and slightly after the Deir Yassin massacre in 1948. Other massacres committed by both Arabs and Zionists are described, although the main purpose of the article, which includes over 100 footnotes, is to examine the events at Deir Yassin where about 150 Arab villagers were executed by Zionist gangs. The Deir Yassin Massacre was followed by the murder of about 70 Jewish medical students in an Arab retaliatory action. A careful reading leaves the impression that both sides have much to answer for. 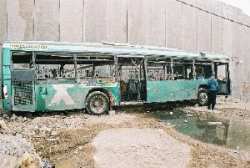 The remains of a bus destroyed by a suicide bomber. Eight people were killed in the attack which was carried out on February 22, 2004. During the early years before the founding of Palestine, the Jewish zionist organizations often developed militias to protect Jews from Arab marauders. The Haganah, a paramilitary group controlled by the Jewish Agency for Palestine, was one. Its members, like David Ben-Gurion, who would become Israel's founding Prime Minister, tended to be open to a two-state solution in Palestine. Other fringe groups attached to the zionist revisionist movement opposed a two-state solution. They regarded all of British Mandate Palestine as rightfully Jewish territory. The revisionists formed their own militias. Two of these militias, the Irgun and Stern gangs, where headed by future Israeli Prime Ministers, Menachem Begin and Yitzak Shamir, respectively. These gangs committed numerous atrocities. In 1944, the Stern gang assassinated Lord Moyne, a British Minister for the Middle East and in 1948 they assassinated the UN Mediator Count Bernadotte. Both Stern and Irgun participated in the Deir Yassin Massacre in 1948, and in attacking British targets. The Irgun also bombed the British headquarters in Jerusalem, the King David Hotel, killing about 100 ( the British government protested on the occasion of this year's commemoration in Jerusalem ). 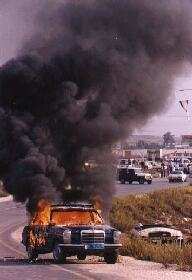 A Palestinian car in flames after having been set on fire by settlers on the Ramallah-Nablus Road, opposite the settlement of Beit El in 1993. There has been a power struggle between the moderate and the revisionist forces, and there continues to be one. In 1944, when Lord Moyne was assassinated, the Haganah took action against the Irgun gang, but was not able to take action against the perpetrators in the Stern gang due an "understanding" with that group. But when Israel was formed in 1948, Prime Minister David Ben-Gurion continued to take action to suppress revisionist militias, and at one point, ordered an attack on the Altalena, a ship which was providing supplies to the Irgun. But clearly, as evidenced by eventual ascendancy of Messrs. Begin and Shamir, leaders in the revisionist faction have come to the forefront, even if the majority in Israel favor a two-state solution and respect for the rights of non-Jews. It is interesting to note that, during Prime Minister Begin's tenure in the 1980s, the "Lehi Ribbon" was introduced as a military decoration for those who served in this terrorist group, and a similar decoration, the Irgun Ribbon, exists for Mr. Begin�s former band of murderers (see the Israeli government source). One might think that the political risk of associating the state of Israel with Jewish terrorists would cause a more cautious approach, but apparently the people who lead the Israeli government don't think it is a problem. 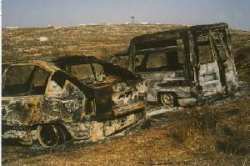 Cars of Palestinian farmers which were burnt by Israeli settlers during the olive harvest near Ramallah, in October 2002. As we have mentioned, factions of both sides have been radicalized. As Hogan shows, this has been the case in the 20s, 30s, and 40s, and is still true. We easily recognize this radicalization in the attacks of Hammas and in the terror-suicide bombings of the al-Aqsa Martyrs' Brigades, and in Hezbollah's rocket attacks. We also see radical measures being applied by the Israeli government - the destruction of the Gaza's power facilities, the bombing of the homes of Palestinian Authority (PA) security officials, and the past destruction and degrading of PA police capability through arial bombing, while simultaneous demands are made that the same PA police disarm terrorists. Israel has also directly targeted civilians in the occupied territories, where they destroyed 4,000 Palestinian homes in only 4 years. This is corroborated by Israeli human rights groups (visit B'Tselem and The Israeli Committee Against House Demolitions). An extensive report on Israeli house demolitions can be found at the U.N. web site here. Palestinians dig under the rubble of houses to search for people trapped by IDF house demolitions in the Jenin Refugee Camp. Notwithstanding Israel's need to defend itself, it seems to be bent on using the most inflammatory tactics, both in the occupied territories, and in Lebanon. When Israel's ambassador to the United Nations, Dan Gillerman, spoke to a crowd of supporters in New York recently, he had this to say about the situation in Lebanon: "to those countries who claim that we are using disproportionate force, I have only this to say: You're damn right we are". The problem is not just that Israel is using disproportionate force and is comfortable with this approach, but that it is making the suggestion that the Lebanese government was able to disarm Hezbollah, and failed through negligence. This is almost certainly not the case. It is common knowledge that Lebanon has recently come through 15 years of civil war, and that a Lebanese military action against Hezbollah could easily split the military along sectarian lines, leading to more years of bloody chaos in Lebanon. But this mirrors Israel's approach to the Palestinian Authority, which was expected to use its weak police force to do what Israel, with all its might, was not able to do, disarm Palestinian terrorists. Is this part of Israel's provocative strategy -- to demand impossible goals, and then respond with disproportionate force when weak governments can not deliver? It does seem that these diplomatic maneuvers are likely a pretense to justify ruthless military actions. November 23, 2003 - Two Palestinians who were blindfolded as punishment after they refused to cleanup trash around the Huwarra checkpoint as they had been ordered by IDF soldiers. There is little hope of a positive outcome from our involvement in the region, as long as attitudes of reprisal, revenge and a desire for hegemony dominate the parties in the Arab-Israeli conflict. And there is great danger that we will be dragged into additional military conflict if we do not disengage now. The solution is to do the responsible thing and stop foreign aid. In the case of Israel, we did this in 1953 when a military unit commanded by Ariel Sharon massacred about 60 people in the village of Qibya. But we should not have just stopped our aid to Israel alone, we should have ceased aid to all Arab nations. It is urgent that we follow General Washington's advice and work to establish neutrality in this and all foreign conflicts which do not impinge on our vital interests. And if in the future we are perceived as not favoring one side, we will better positioned to serve as a trustworthy mediator in the region, and less likely to suffer terror attacks on American soil.